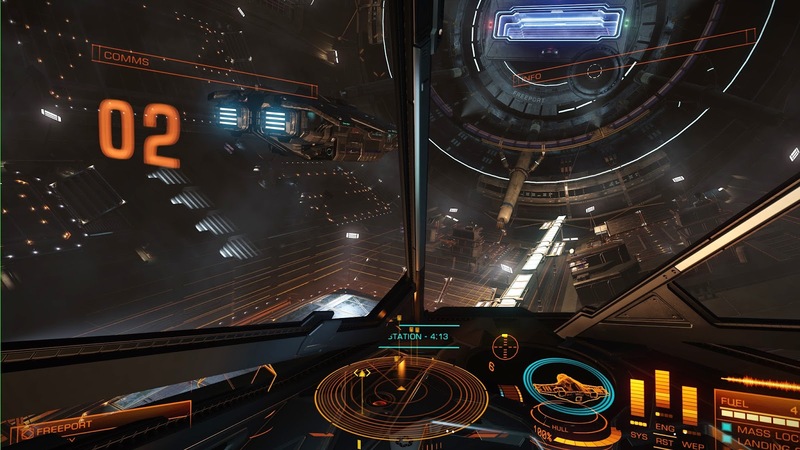 View out the 'Moon Roof' of my Eagle MK III, staring at Freeport Dock in the Anarchy system of LP-98-132. 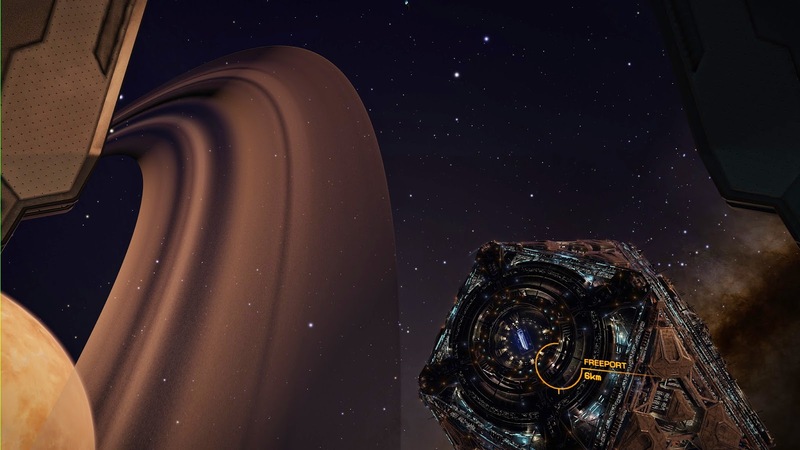 Note the planet's rings.. which you can fly close to, and see they are individual asteroids.. and you can pick one.. drop gear and LAND on it if you like! 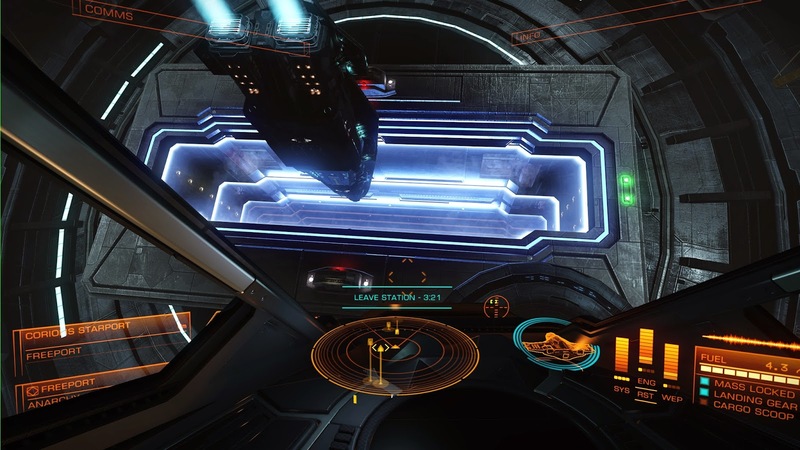 So now for something completely different, I have been playing some Elite: Dangerous beta lately, and got together with Clockwerks from http://clockwerk-warriors.blogspot.ca/ Its basically a space game where you can do what you want, except you have to fly your ship (rather than click stuff like in EVE) including docking from hollow cube stations. We decided to get some testing in vs NPCs, though we can at any time play vs 'the world' and possibly get ganked by player pirates, especially in Anarchy zones such as Freeport. Speaking of, as I was lifting off to follow Clockwerks, I saw this Anaconda lifting off from pad 02. Its a large ship, and bristling with weapons, we are in small light fighters..
View from the outside, these things spin to make artificial gravity, and you can see the blue forcefield aka "the mailslot" where ships have to come in and out, and in the background the Milky Way and Large Magellenic Cloud can be seen. The game has 160,000 of the closest stars to Earth in the game, and will procedurally generate the rest of the Galaxy. The background stars are the ones around your current location.. so the constellations don't match our night sky in this case. Unlike EVE, even when traversing large distances within a solar system, you can steer your ship and go where you want to. 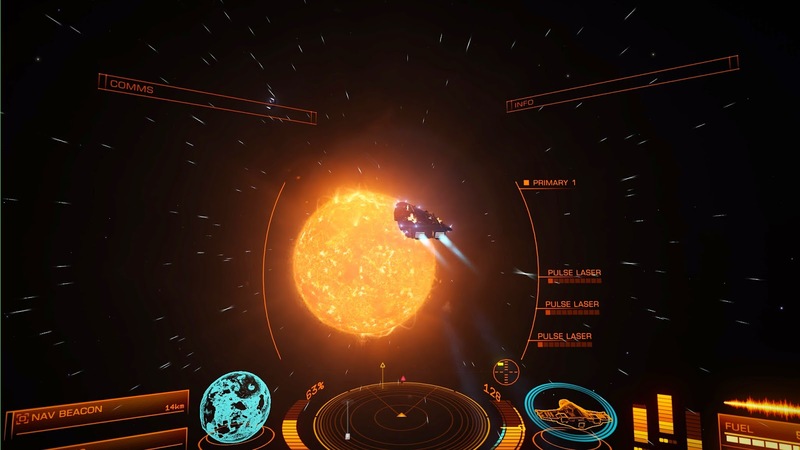 Here I am travelling at 12.8 x the speed of light, following Clockwerks (small blue comet looking blue dot center of the HUD) This is still in Beta, but is a freaking blast. Recommended you run a joystick and throttle.. since this is more of a sim than a space shooter.. So yeah.. this is my guilty pleasure when not painting my Panzer IVs like I ought to be!! 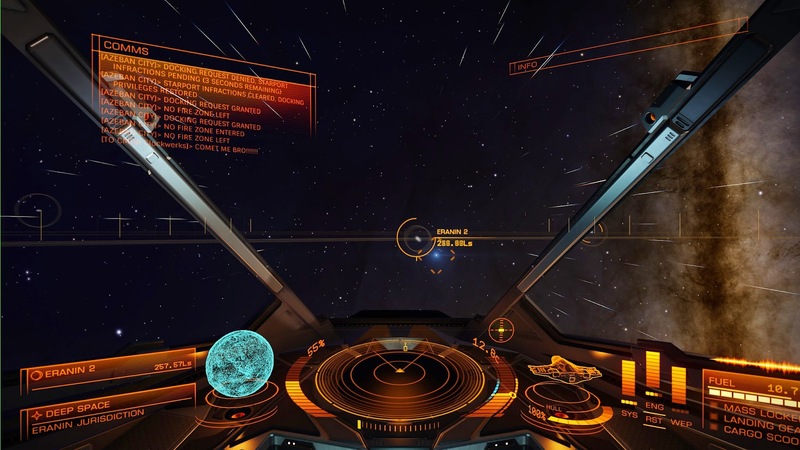 Awesome night playing Elite man. I can totally see how this game is going to rock with buddies to get into dog fights with. That Dread we were fighting against was epic!